MAY 20 14 – 2:10 PM — There’s something oddly compelling about a man with a rather large plastic wedge of cheese perched on his head. Even more noteworthy are moments when he’s presiding over a tasty reception where crafty chefs have created impressive nibbles using award-winning cheeses — an occasion to savour and celebrate, I discovered the other day at Juniper Kitchen & Wine Bar. 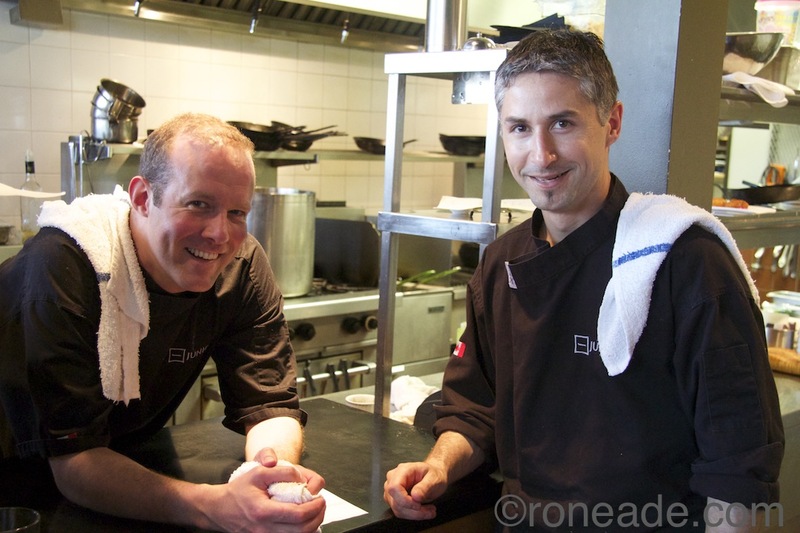 There, chefs/owners Norm Aitken and Peter Robblee produced assorted hors d’oeuvres using artisan food products that will be front and centre at the fourth annual Great Canadian Cheese Festival to be held June 7 and 8 in the Crystal Palace in Picton, Ont. 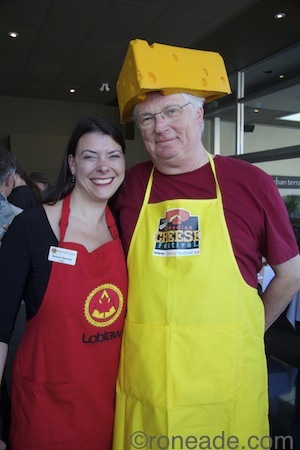 Left, cheese sommelier Vanessa Simmons of Savvy Company with the grand fromage himself, George Kolesnikovs, director of the Great Canadian Cheese Festival. Cheese makers, artisan food producers, small-batch wineries and craft breweries are among 125 booths that will be set up, making the show the largest cheese festival in the country. “Last year we estimate 4,000 people attended,” says Peta Shelton, exhibit co-ordinator. “It’s the only national cheese festival in Canada, and for the first time we organized the Canadian Cheese Awards open to artisan producers with 100-per-cent Canadian content and no additives, in all categories including sheep, goat, cow and water buffalo cheeses. “The festival has really taken off,” Shelton adds. That’s more than 125 different cheeses under one roof, for those who are counting. The Juniper restaurant reception was organized by Savvy Company with Vanessa Simmons, cheese sommelier and judge of the cheese awards. Also on hand was George Kolesnikovs, festival director and man with the funny plastic hat. Artisan cheese is defined as one where the cheese maker, producing small batches using between 250 and 1,000 litres of milk, is involved every step of the way beginning at the farm. A large cheese company like Parmalat would process in one day what an artisan like Le Baluchon in Quebec uses in a year — about 300,000 litres of milk. “You also get more of a sense of terroir with artisan cheese because of the quality and individuality of the milk,” Simmons says. Savvy Company delivered a mystery box of artisan food products to Juniper chefs about two hours before the reception, which they were asked to use in hors d’oeuvres. 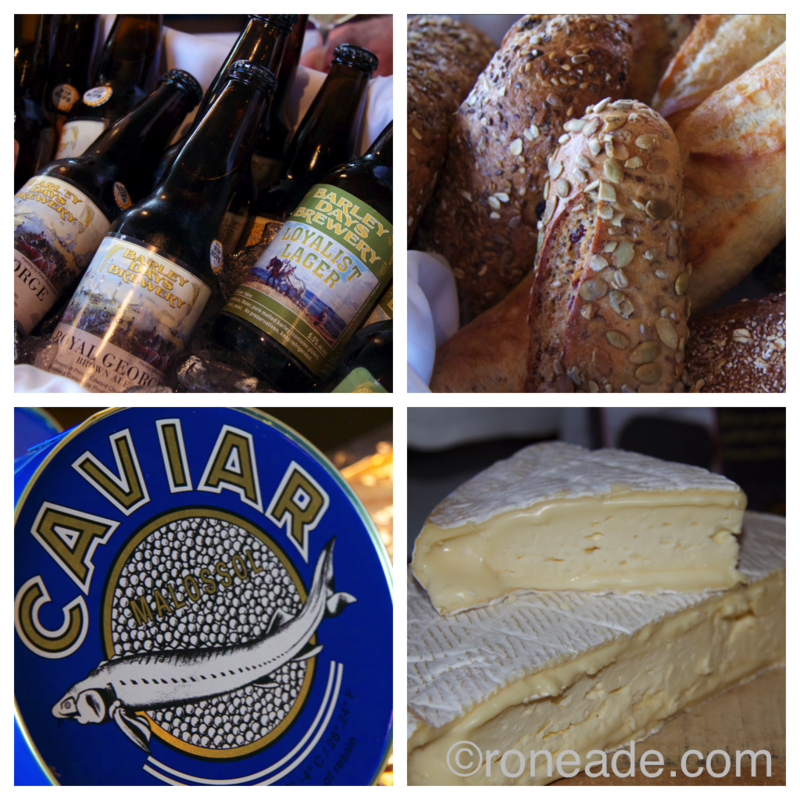 Items included four award-winning cheeses, Acadian sturgeon caviar from New Brunswick, sturgeon pâté, tomato mustard chutney from Manning Canning. To wash it down, guests sampled wines from Huff Estates in Prince Edward County, and craft beers from Barley Days Brewery. 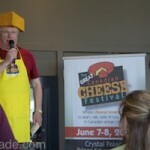 For details and a complete list of festival events, link to Great Canadian Cheese Festival here. Top, whipped Magie di Madawaska cheese (judged Best Bloomy Rind in the Canadian Cheese Awards announced in April) on sliced cucumber with Acadian sturgeon caviar. 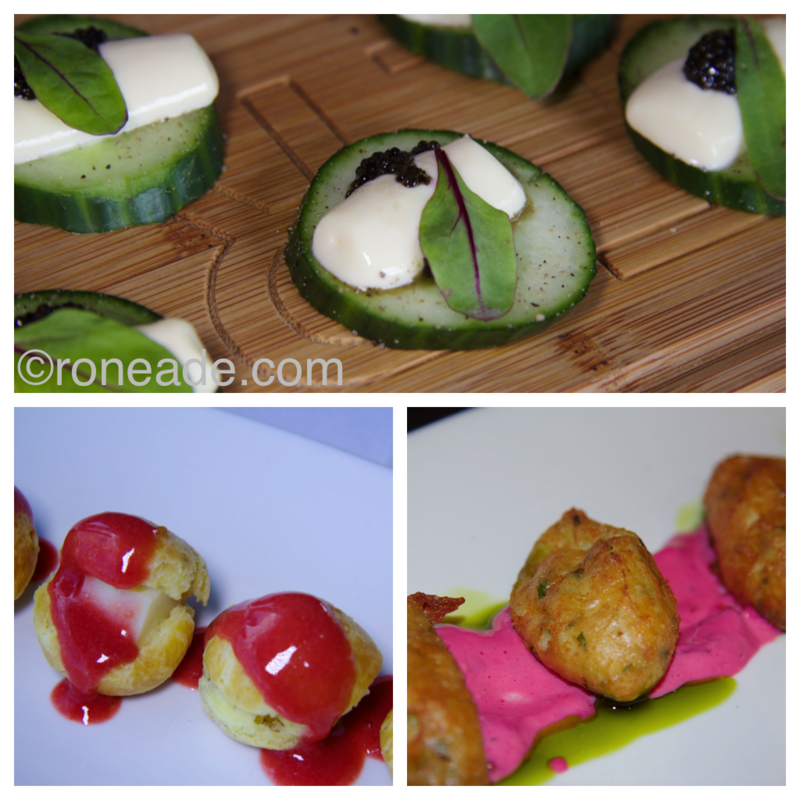 Bottom left, peppercorn gougère stuffed with Eweda Cru raw sheep’s milk cheese (Best Firm Cheese award) with strawberry and white balsamic pulse. Right, Dragon’s Breath Blue (Best Blue Cheese Award) fritter with beet aioli. Top, Acadian smoked stugeon pâté and sundried tomato mustard from Manning Canning. 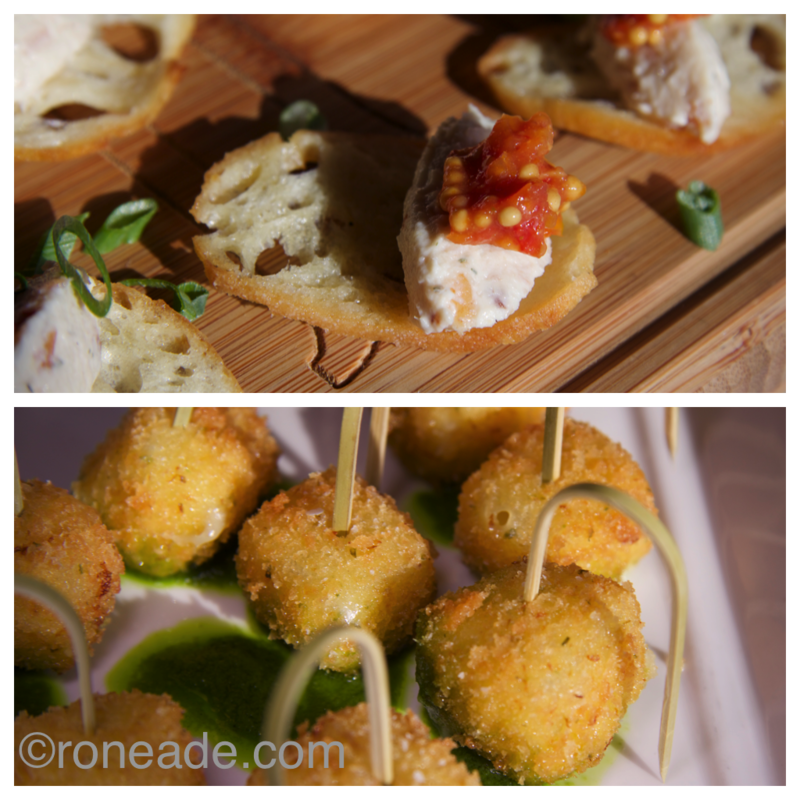 Bottom, Le Baluchon (Best Cheese of the Year award) crusted and fried with wild garlic pulse.